The Sphere 1 computer, one of the earliest microcomputers, was touted by its creator—Michael Donald Wise (1949-2002), the founder and president of Sphere Corporation, a computer company based in Bountiful, Utah, as the first true PC, because it had a keyboard (with a number pad), a monitor, external storage, and did not run on a punch tape (prior microcomputers lacked the user I/O interface built into the Sphere 1). The Sphere 1 also included a keyboard operated reset feature consisting of two keys wired in series that sent a reset signal to the CPU triggering a hard reboot. Wise considered this to be the first keyboard activated reset, a predecessor to the now-common Ctrl-Alt-Delete key combination. The Sphere keyboard has two reset switches and both had to be press at the same time. One was in the upper right of the keyboard and one was in the lower left, thus a reset required two hands. The Sphere 1 was created by Michael Wise in early 1975 and announced in November. Initially, Sphere 1 was sold as a kit, but later became available to consumers fully assembled. The machine had a limited run of 1300 units (about half were sold as kits and the remainder were sold assembled), with initial price $860. 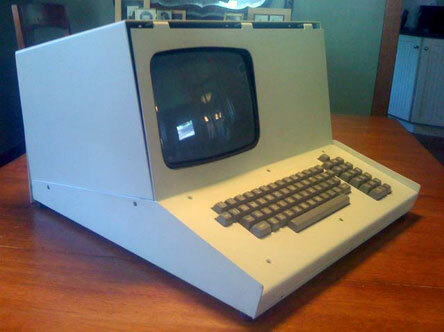 The Sphere 1 featured a Motorola 6800 microprocessor, 4KB DRAM, on-board EPROM, monitor and keyboard. The peripheral selection includes floppy disks, printers, paper tape punches and readers, additional terminals, digital I/O, etc. The ROM of a basic system contains drivers, BASIC language, debugger and assembler. When the disk system is purchased, the user received FDOS (disk operating system with an editor, file structure and full assembler) (for a full description, see the Sphere 1 brochure). Michael Wise was an inventor and creative genius, not a businessman. His company began advertising before the product was fully debugged in order to finance its growth. Enormous, unexpected demand overwhelmed the company, which was literally killed by success (Michael Wise resigned as president in March 1976 and Sphere Co. entered bankruptcy in April 1977.) Competitors quickly filled the void. 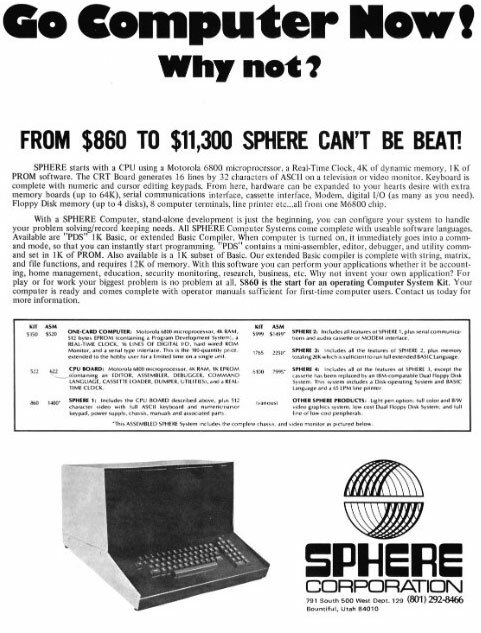 Nonetheless, the Sphere had made its mark on the history of the personal computer, and contributed to both the specs and design of future generations of hardware. Sphere 1 inspired many copycats. Michael Donald "Mike" Wise was born on 22 June, 1949, in Wiesbaden, Germany, to Donald Wise (1918-2007), a Major in the Air Force stationed in Germany, and his wife Bonnie Jean Eacho Wise (1921-1988). He was the third of 5 children born to the family. Mike attended 24 schools worldwide before graduating from High School in Brewster, Washington, in 1968. That summer Mike began college at Brigham Young University in Utah and took a course in BASIC using an IBM 360/50. From that point on he quickly became what we would call a hacker. While in college, he wrote device drivers and two operating systems, and also managed to go to school. He also started his first programming business, IPCS, in 1970, developing a mailing list program on an NCR Century 50. Other computers he used in school included the SEL-810b, IBM 1130, IBM 370/65, IBM 650, and the IBM 1410. 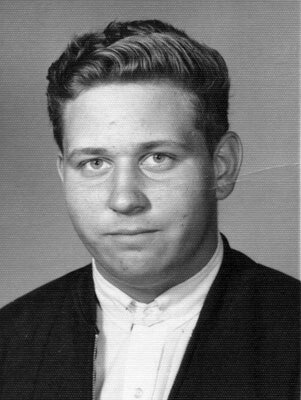 In 1971 Mike began teaching at the College and was on staff for 18 months before leaving for an engineering company that used the PDP-11 computer in Automated Inventory Control (Robotics) applications. Wise quit two years later to start his own Sphere Corporation in 1975. 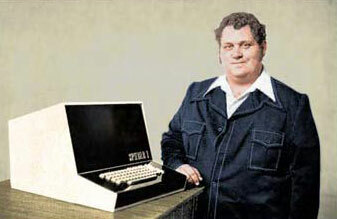 Later Wise was involved in the development of the TRS-80, Commodore PET, and the Macintosh, as well in the building and selling the first screen-based microcomputer WYSIWYG word processor, and numerous other "firsts". Later he had also a successful career in software development starting A-Systems Co. in 1978, the first company to provide job cost accounting software for the PC, as well as his own Internet business. Michael Donald Wise passed away on 28 December, 2002, in Salt Lake City, due to complications of diabetes.